Finding healthy recipes is easier than ever, with thousands of free recipes available online. With the growing media attention on overweight and obesity, people are becoming more concerned about their health and the health of their family and friends. 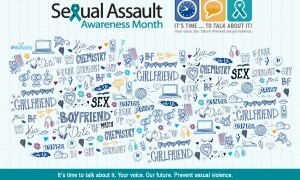 This is especially true for pre-teens (9–12 year olds) and teens. At this age, children begin to assume more control over their eating habits, deciding what to eat at school, with friends, and at home. At the same time, they are becoming more self-conscious about their appearance. Developing healthy attitudes about eating and physical activity—especially among pre-teens and teens—requires good communication. It is important that children of this age begin to understand more about health and nutrition. Effective communication leads to better decision-making about the foods people choose to eat, as well as the activities in which they choose to engage. For pre-teens and teens “healthy” eating doesn’t always seem like very much fun—and for adults, the sentiment is often the same. But a fun recipe that is full of healthy items can help bridge that communication gap. With that said, I bring you Chole Masala. Chole Masala or Chana Masala is a popular north Indian curry. 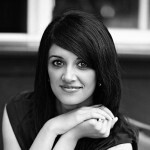 Chole goes well with puri, roti, naan or rice. 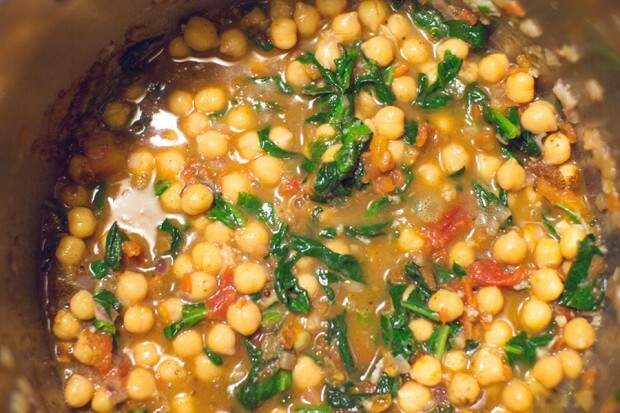 To start, this recipe features the healthy and delicious chickpea. Chickpeas are naturally low in fat, high in dietary fiber, and rich in vitamins and minerals. Eating chickpeas regularly can help manage weight, boost intestinal health, and reduce the risk of developing type 2 diabetes. You definitely want to keep them on your “digestive support” list—especially if you are focusing on the colon. Between 65 and 75 percent of the fiber found in chickpeas is insoluble fiber, and this type of fiber remains undigested all the way down to the final segment of your large intestine (colon). Recent studies have shown that garbanzo bean fiber can be metabolized by bacteria in the colon to produce relatively large amounts of short chain fatty acids (SCFAs), including acetic, propionic, and butyric acid. These SCFAs provide fuel to the cells that line the intestinal wall. 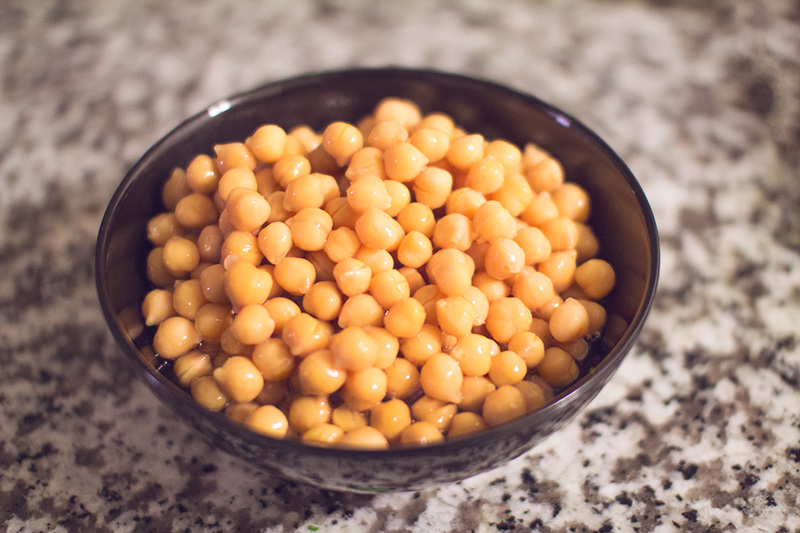 By supporting the energy needs of intestinal cells, the SCFAs made from garbanzo fibers can help lower the risk of colon problems, including the risk for colon cancer. And then there’s the spinach (admittedly, a hard sell to some). Including dark leafy greens like spinach is important for skin, hair and bone health, they provide protein, iron, vitamins, and minerals. The possible health benefits of consuming spinach include improved blood glucose control in people with diabetes, lowered risk of cancer, lowered blood pressure, improved bone health, lowered risk of developing asthma, and more. Research shows that Americans increasingly believe that their food and beverage choices can positively impact their health. With 85 percent of people interested in learning more about foods that can provide benefits, consumers are ready for actionable advice that addresses a host of issues, from weight management to immune function and how to improve their overall health and wellness. Olive oil – 1 1/2 tsp. Dhania (coriander) powder – 2 tsp. Chole masala (chickpeas) – 1 tsp. 1) Soak 2 cups of chickpeas overnight. 2) Pressure cook the chickpeas in some water and keep aside. 3) In a pressure pan, add 1 tsp. 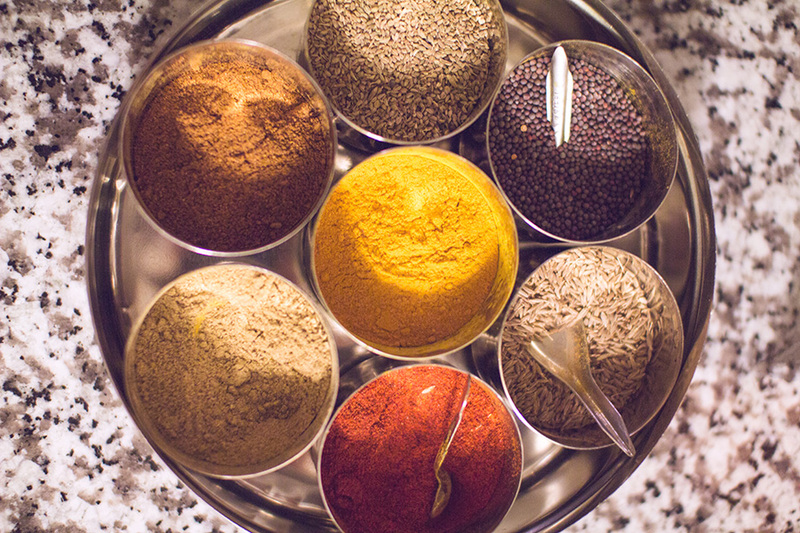 of oil, add the cumin seeds, mustard seeds, asafoetida, ginger, and garlic and sauté. Add the slit green chilies. 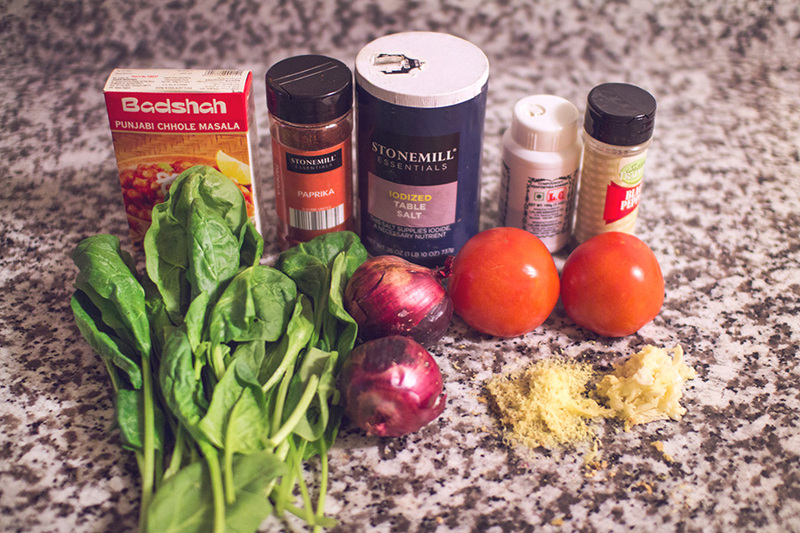 4) Add the onions and tomatoes and sauté until the onions turn a light brown. Add salt and pepper. 5) Add turmeric, cumin powder, coriander powder, paprika, garam masala, chole masala, and sauté until the tomatoes are soft. Add about 1/2 cup of water and let it boil. 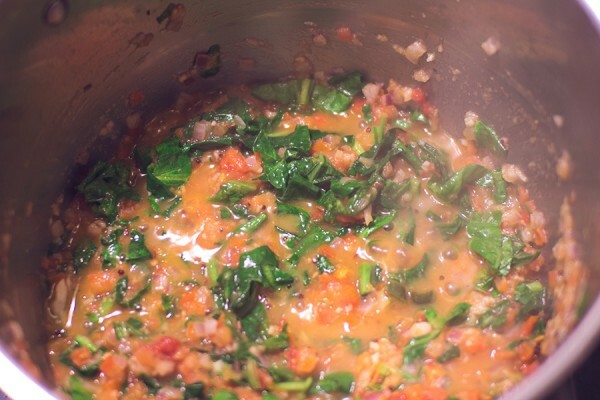 7) Add the chopped spinach leaves and simmer for around 10 minutes with the lid of the pressure pan closed. 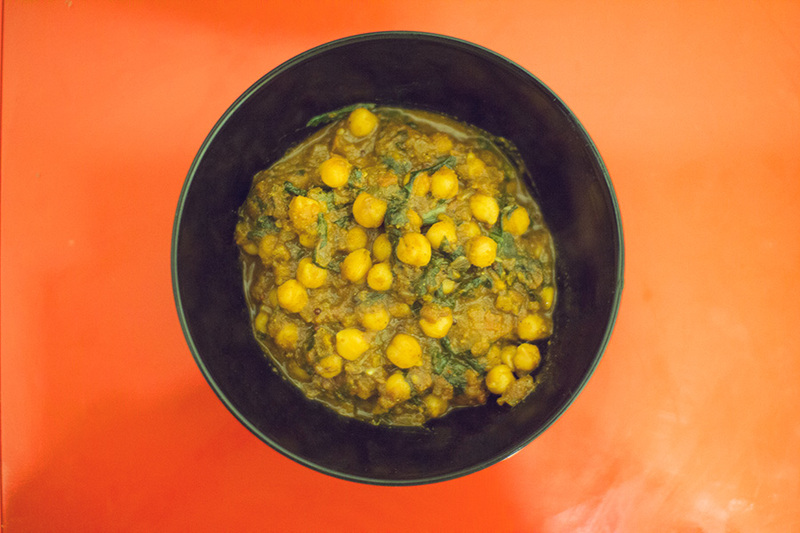 8) Add the chole masala (chickpeas), lemon juice, and sugar. Let it cook on medium heat for about 15 minutes, while stirring occasionally.